The honest-to-goodness truth is…I don’t like pimento cheese. Bless me and my Southern roots, but I don’t. Or rather I should say, I don’t really like any pimento cheese except for this one teensy little recipe that my sister came up with. It’s a little bit spicy, a little bit pimento-y, and a whole lot of cheesy! My sister is super brilliant y’all. I mean, she is so, so, so smart. She is so smart that when we were in college, I did most of the cooking. She would bring me a box of macaroni and cheese and ask me to make it. I was convinced she just couldn’t cook. The fact that she could make sugar cookies and congo bars from scratch just kind of didn’t register. In actuality, she just had better things to do than to cook mac ‘n’ cheese. Obviously, she’s the smart sister! The realization that she is a fabulous cook came to me one day when she was describing what she had made for dinner. Venison stuffed with vegetables and herbs, rolled, and smoked on the grill. Dang. I’m not mad though. Maybe a little jealous that she came up with that whole non-cooking ploy before I could, but not mad. My sister is incredibly good to me and she takes me to nice dinners and makes me yummy treats on demand. Who could be mad about that?!? 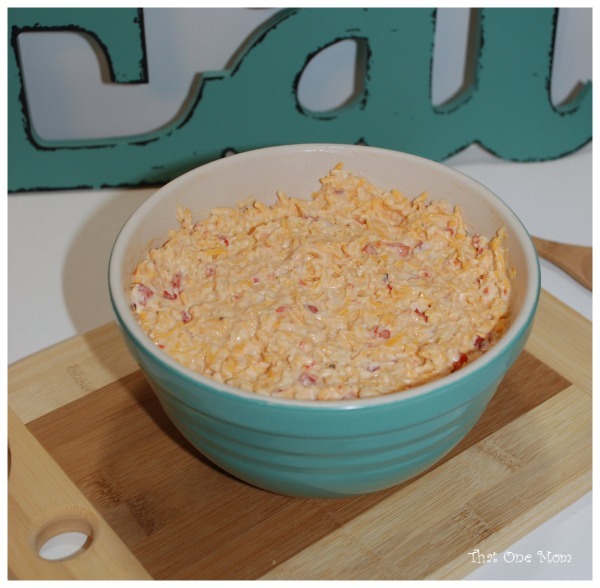 We were visiting her several years ago when I discovered this delicious version of pimento cheese. I guess it’s the spice that makes it different or maybe the Worcestershire. I just know it doesn’t taste like the stuff I ate as a kid. (I know I said I don’t like other versions, but I ate a lot of stuff I didn’t like growing up. Liver and onions anyone?) Any who, this stuff slathered on some Club crackers is the bomb-diggety. It’s probably good on tortilla chips too. And I intend to add it to a sandwich with some other fun ingredients–just to see how that goes. Place all ingredients in a bowl and mix until everything is incorporated. Chill and serve. Great with crackers, on a piece of celery, or in a sandwich. This pimento cheese is versatile. It can be used for holidays, tailgating, picnics, or any appetizer night! Hope you enjoy it like I do and thanks Sissy for letting me share your recipe!